The 51,637-square-foot Bed Bath & Beyond and the 44,477-square-foot Sports Authority stores are at 390 and 394 East H St. at Terra Nova. Both buildings, which were once a single Home Depot, are fully leased. The two buildings were sold by the Terra Nova Group, a unit of R&V Management of San Diego. NewMark Merrill manages Terra Nova Plaza, which even before this sale was divided into several ownerships. The transaction was handled by Mike Moser and Gleb Lvovich of CBRE. RREEF Property Trust is a publicly registered, nontraded company that intends to qualify as a real estate investment trust meant to acquire industrial, retail, office and multifamily assets. The company is known for having multiple funds for the acquisition of real estate throughout the country. RREEF has been active in the buying and selling of millions of square feet of San Diego-area office and industrial real estate for decades. "RREEF Property Trust employs a blended strategy that includes commercial real estate, publicly traded real estate securities, real estate-related debt and cash equivalents," the trust stated. "RREEF Property Trust targets investments in income-producing properties with established cash flow and the potential for value appreciation. RREEF Property Trust focuses primarily on U.S. commercial real estate assets selected from the sectors." A RREEF entity may have taken a bit of a hit when J.P. Morgan Chase (NYSE: JPM) announced that it would be shuttering its 129,000-square-foot mortgage processing center at 10790 Rancho Bernardo Road in late 2013. Instead, the departure proved to be an opportunity, as Scripps Health has not only taken the entire space, but also owns the building. The property is unusual in that it has 40,000-square-foot floor plates. RREEF America LLC is the sponsor and advisor of RREEF Property Trust. RREEF America LLC, together with its affiliates in Europe and Asia, comprise the global real estate investment business of Deutsche Asset & Wealth Management (formerly RREEF Real Estate), a division of Deutsche Bank. With $1.31 trillion in assets under management as of June 30, Deutsche Asset & Wealth Management is one of the world's leading investment organizations. 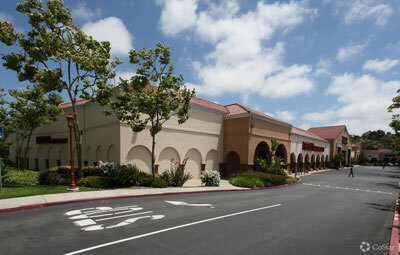 R&V Management, while it owns some retail, is best known for owning and managing 7,000 apartments in San Diego, including some near Terra Nova Plaza. Along with managing Terra Nova Plaza, NewMark Merrill owns or manages the 345,000-square-foot Mission Marketplace at College Boulevard and Highway 76 in Oceanside, and the 137,000-square-foot Piazza Carmel shopping center in Carmel Valley. The firm also manages the 356,000-square-foot Grand Plaza shopping center at Las Posas Road and Highway 78 in San Marcos.